Monday 30th June 2014 – 6.15pm – Murray MacGregor. A horse rider will not be going anywhere near a saddle for a considerable period after her mount landed on top of her fracturing her pelvis. The unfortunate incident happened in land off the A521 between Cheadle and Forsbrook at around 12.15pm on Monday lunchtime. A rapid response vehicle was first on scene and was backed up by the Midlands Air Ambulance from Cosford. A West Midlands Ambulance Service spokesman said: “The ambulance staff were told that for some reason the horse reared up unseating the rider. Unfortunately, after the 20 year old hit the ground, the horse landed on top of her. “The woman was complaining of pelvic and leg pain. After being given analgesia, she was immobilised using a pelvic binder, a leg splint and neck collar before being taken to the aircraft on a scoop stretcher. Monday 30th June 2014 – 11.30am – Murray MacGregor. A combination of good planning, the heavens opening and the public heeding our warnings meant the weekend turned out to be very busy but not record breaking. Over the three days, Friday to Sunday, the Trust dealt with 7,889 incidents, which was almost six percent up on last year. That is equivalent to over 145 incidents a day more than 2013. Acting Emergency Services Director, Nathan Hudson, said: “Whilst not a record breaking weekend, no-one should be in any doubt as to just how busy it was. Saturday night, in particular, was horrendously busy at points which is probably down to it being a pay day weekend. “Being able to perform at the high levels we did, despite the continued high levels of demand is down to good planning and the exceptional hard work of our staff in often very difficult circumstances. “I would also like to thank the public for their assistance. It is absolutely vital that the public use the ambulance service sensibly so that we can get to the people that really need our help quickly and save lives. “By using self-care, advice from a pharmacist, minor injury units / walk in centres, GP services both in hours and out of hours and the 111 service will ensure patients get the treatment that they need, in the right place and at the right time. “Although we have got through this weekend, there is no sign the level of demand shows any sign of reducing and it is still considerably above what we would expect to see at this time of year. Sunday 29th June 2014 – 10pm – Steve Parry. A woman has been taken to hospital following a road traffic collision in Longford, Coventry this evening. West Midlands Ambulance Service was called to the junction of Vinecote Road and Longford Road at 8.20pm. Two ambulances, together with a paramedic officer and the MERIT team including a trauma doctor were sent to the scene. A West Midlands Ambulance Service spokesman said: “Crews responded to a road traffic collision involving two cars. “A woman, believed to be in her thirties, and the driver of the car was trapped in her vehicle. She was released by emergency services and treated for abdominal and leg injuries. “The patient was immobilised and taken to the University Hospital of Coventry and Warwickshire. Saturday 28th June 2014 – 11.10pm – Murray MacGregor. 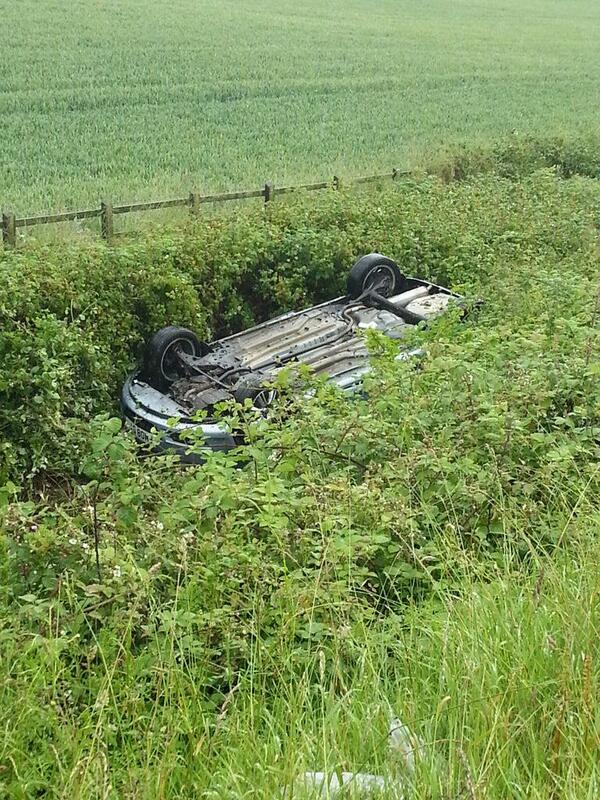 A couple have escaped injury despite their car leaving the M42 and ending up upside down in a field. The crash happened between junctions 3 and 2 at about 5.10pm on Saturday afternoon – it was raining heavily at the time. Callers who dialled 999 said that the car had spun before leaving carriageway. An ambulance crew and a senior paramedic officer attended the scene. The couple in the car were taken to Hopwood Services to help get the motorway moving again. After a check up they chose not to go to hospital. All ambulance resources were clear by 6.20pm. Absolutely no doubt that they were very lucky indeed. Saturday 28th June 2014 – 9.30am – Steve Parry. A man has been taken to hospital following a road traffic collision in Birmingham earlier this morning. West Midlands Ambulance Service was called to Emily Street and Stanhope Road at just after 3.50am. An ambulance together with two paramedics in a rapid response vehicles were on the scene within minutes of the call. A West Midlands Ambulance Service spokesman said: “Ambulance crews responded to a two car collision in the City. “A man in his forties was trapped for almost two hours before being released by firefighters. Friday 27th June 2014 – 11.30pm – Steve Parry. A total of eight patients have been taken to hospital following a road traffic collision in Walsall this evening. West Midlands Ambulance Service was called to Darlaston Road just after 9.30pm. Three ambulances, a paramedic officer in a rapid response car and the Medical Emergency Response Incident Team (MERIT) were sent to the scene. A West Midlands Ambulance Service spokesman said: “Ambulance crews responded to a two car road traffic collision this evening. “A man believed to be in his thirties was treated for chest injuries. He was immobilised with the use of a neck collar and spinal board before being conveyed to Walsall Manor Hospital. “A woman passenger in the same vehicle and believed to be in her thirties was trapped in the car for almost an hour. She was treated for pelvic injuries and taken to the Queen Elizabeth Hospital. Friday 27th June 2014 – 6.15pm – Murray MacGregor. A lorry driver has been airlifted to hospital with possible pelvic injuries after falling off the back of his truck and knocking himself out. The incident happened in Cobham Road in Pershore at about 11:20am on Friday morning. A rapid response vehicle, an ambulance and the Midlands Air Ambulance from Strensham were sent to the scene with the aircraft landing in a nearby school. A West Midlands Ambulance Service spokesman said: “The ambulance staff were told that the 43 year old from Leicestershire had fallen about five feet and had initially lost consciousness. “He was complaining of pelvic pain and also had chest pains when he breathed in and out. “He had a pelvic binder applied, was immobilised and given pain relief before being taken on the ambulance to the aircraft for onward airlift to the major trauma centre at the Queen Elizabeth Hospital in Birmingham. 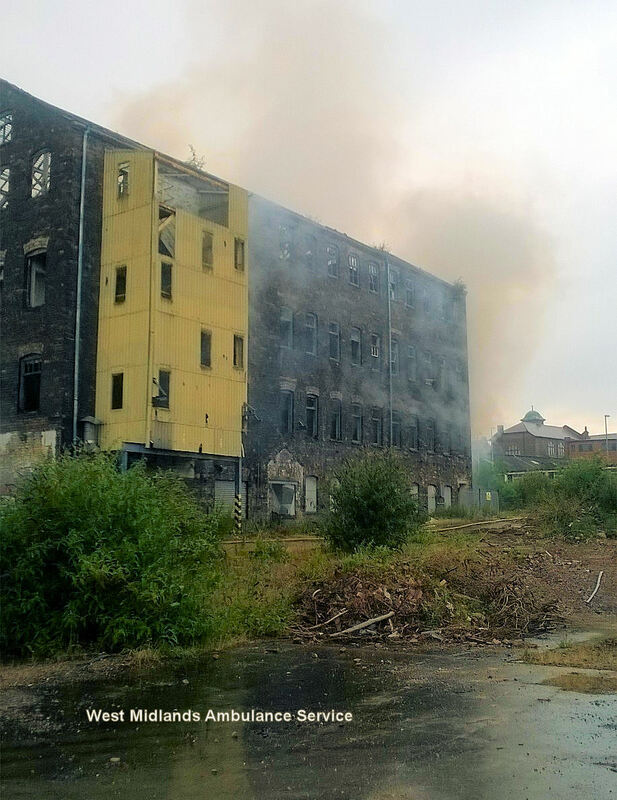 WMAS attending fire Old Royal Dalton Factory in Burslem. None injury. Friday 27th June 2014 – 3.35pm – Murray MacGregor. Ambulance bosses are appealing for the public’s help to identify a man who mounted an unprovoked attack on a moving ambulance as it took a patient to hospital. The incident took place at around 10.20am on Sunday 22nd June in Bolton Road near the junction with Soho Road in Birmingham. Thankfully no-one was hurt in what was a very frightening situation, but the ambulance had to be removed from service as a result of the attack. Trainee Ambulance Technician, Hannah Martell was driving the ambulance when the attack happened. She said: “We had just turned into Bolton Road when I noticed a man on the pavement with a bottle in his hand. The next thing I knew he was throwing it at the side of ambulance. “The bottle hit the glass pain on the door which immediately cracked. When I stopped the vehicle further up the road, it shattered completely. 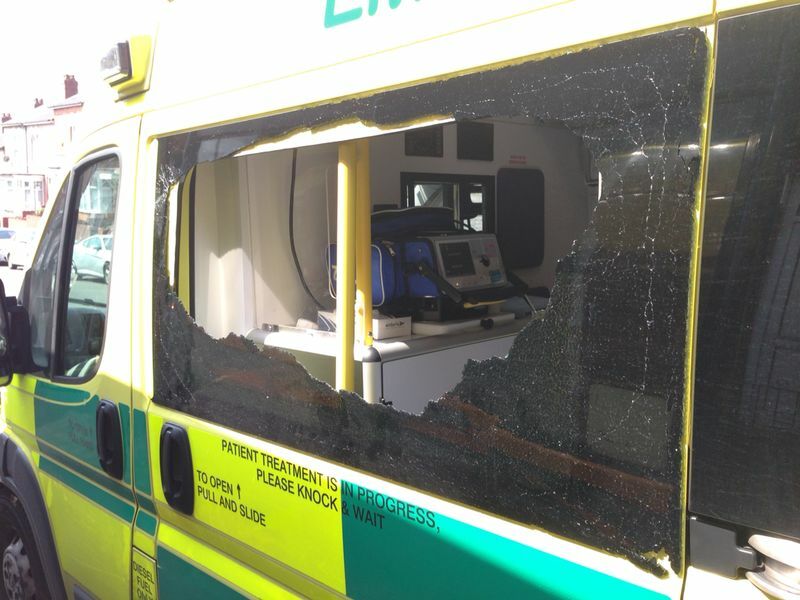 “Thankfully the safety glass did its job and only a few pieces of glass ended up inside the ambulance, but as you can imagine, it was a very frightening experience for all of us. “Given my colleague was sitting right by the window you can only imagine what could have happened. It just doesn’t bear thinking about. “At the time we were taking a 38 year old man who had been vomiting blood into City Hospital. Due to the damage to the ambulance, we had to get another one to come and meet us. “Given how busy Sunday was, this resulted in even more pressure being put on the service as we needed wto ambulances instead of one and obviously we had to stop using the damaged vehicle and swap over to another one which meant we weren’t able to respond to incidents while that happened. Acting Emergency Services Director, Nathan Hudson, added: “This was an appalling incident that makes you wonder about the mentality of some people. “The incident happened fairly close to a bus stop so I would urge anyone who has any information to contact West Midlands Police so that we can bring the perpetrator to justice. If you have any information, please contact West Midlands Police on 101 and ask to speak to Birmingham Western Central. Friday 27th June 2014 – 8.50am – Murray MacGregor. Those are the words of a paramedic officer who was one of the ambulance staff that treated at teenager who came off a quad bike in the Dudley area yesterday afternoon (Thursday). The incident happened in Lodge Crescent in Netherton at about 4.45pm. Callers who dialled 999 described the quad bike rolling over four times and landing on the rider, leaving him unconscious. An ambulance, two rapid response vehicles and a paramedic officer attended the scene. A West Midlands Ambulance Service spokesman said: “When ambulance staff arrived they found a teenager who was semi-conscious lying half on the road and half on the pavement. “They were particularly concerned as the lad was not wearing a helmet and witnesses told them that he had hit his head when he landed. “The patient came round as he was being treated for pain in his head, and had grazing to his right shoulder and elbow. “Staff at the scene described him as being ‘very, very lucky’ not to have suffered more serious injuries. “Whilst you do not have to wear a helmet on a quad bike, the Trust would urge you to treat a quad bike exactly the same as a motorcycle and wear appropriate protective clothing. “As a Trust we have attended many incidents where quad bike riders have come off particularly as they go around corners. There have also been high profile cases of riders suffering head injuries after coming off quad bikes. It’s one of the biggest killers in the UK, so what do you know about Sepsis? Sepsis is one of the biggest killers in the UK, yet it few people know much about it. It claims 37,000 lives every year in the UK. In comparison, breast cancer claims less than 8,000 lives a year. Sepsis is a life threatening condition that arises when the body’s response to an infection injures its own tissues and organs. 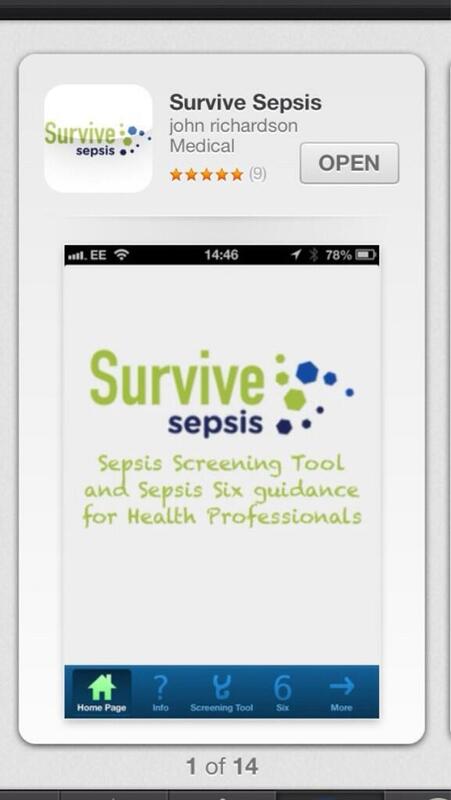 Sepsis leads to shock, multiple organ failure and death especially if not recognised early and treated promptly. Sepsis is caused by the way the body responds to germs, such as bacteria, getting into your body. 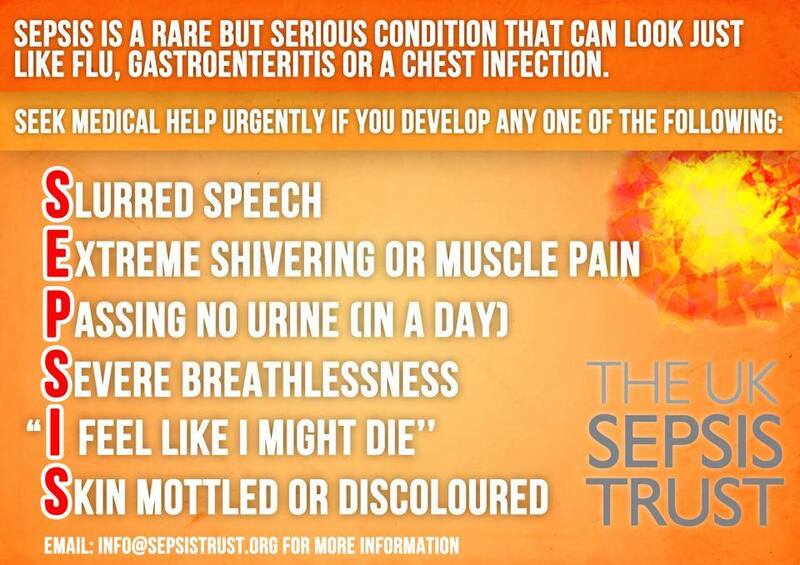 If you would like to find out more, have a look at the Sepsis Trust: http://www.sepsistrust.org where you can find a ‘Symptom Checker’ card which gives a list of six symptoms to look out for. Thursday 26th June 2014 – 10.30am – Steve Parry. Three men have been taken to hospital after a road traffic collision in the Northfield area of Birmingham this morning. West Midlands Ambulance Service was called to Frankley Beeches Road at just before 9.15am. Three ambulances and a paramedic officer attended the scene. A West Midlands Ambulance Service spokesman said: “Three men were treated for their injuries following a collision involving two vehicles in Northfield. “A man believed to be in his sixties and a male in his twenties travelling together in one of the cars involved were treated for back injuries. They were immobilised with the use of a neck collar and spinal board before being taken to the Queen Elizabeth Hospital. Thursday 26th June 2014 – 10am – Steve Parry. A woman has died following a road traffic collision involving the car she was driving and a pick-up in Warwickshire. West Midlands Ambulance Service was called to the junction of the A423 and the A425 at Ufton shortly after 6.15am today. An advanced community paramedic, a paramedic area support officer and the MERIT trauma team consisting of a trauma doctor and a critical care practitioner attended in rapid response vehicles. Two ambulances also attended. A West Midlands Ambulance Service spokesman said: “From the outset, it was apparent nothing could be done to save the woman driver who was confirmed dead at the scene. Thursday 26th June 2014 – 1oam – Steve Parry. 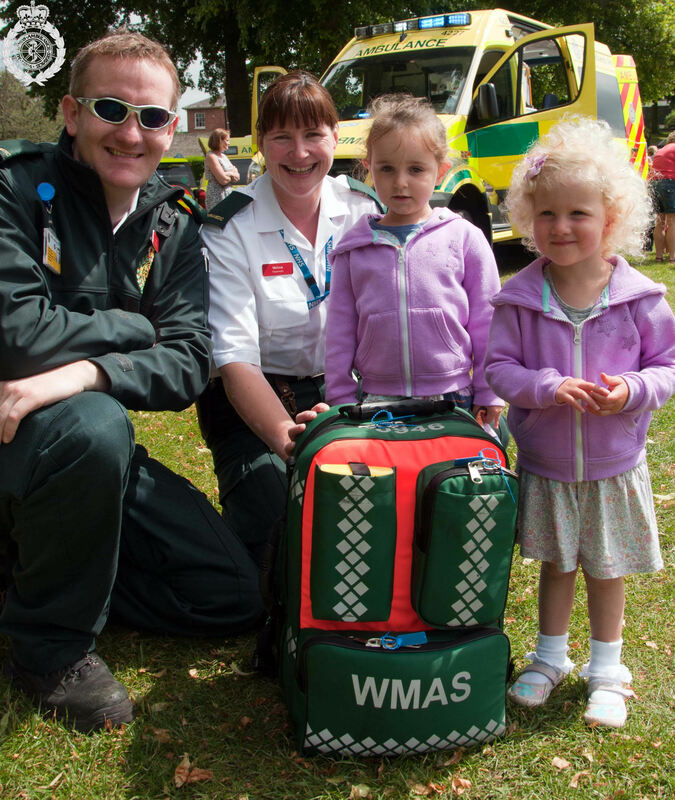 Following the success of West Midlands Ambulance Service flying the flag at Birmingham Pride last month, the Trust is to be represented at Warwickshire Pride this weekend to celebrate diversity. Members of the Trust’s lesbian, gay, bisexual and trans (LGBT) working group will be enjoying the event which is being held at the Pump Room Gardens, Leamington Spa on Saturday 28th June, to support the region’s LGBT communities. The first Warwickshire Pride took place in August last year and was the first event of its kind in the county. It was a festival of LGBT culture, and aimed to celebrate the diversity of the county and bring people together, with over 2000 people attending. 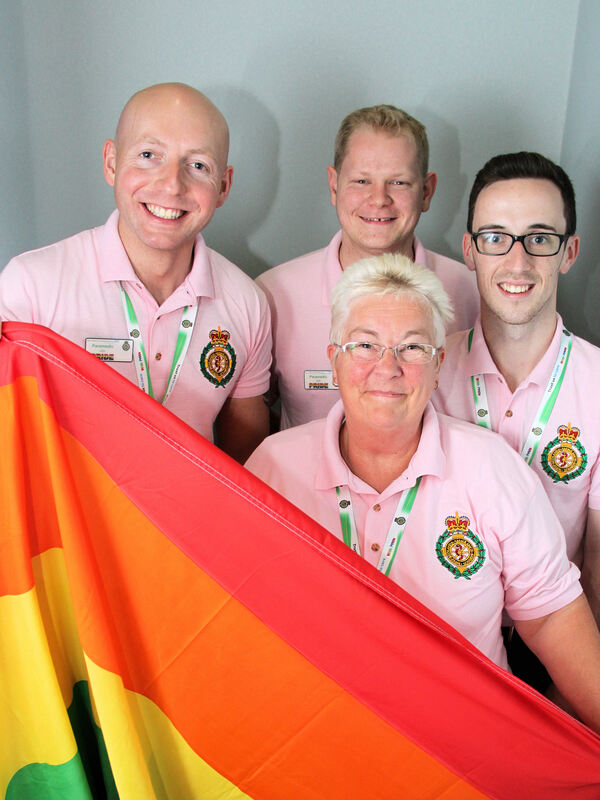 John Renshaw, a Birmingham-based Paramedic Clinical Team Mentor and member of the working group, said: “As part of the Trust’s community engagement, the Trust’s presence at Birmingham Pride, one of the biggest gay pride events in Britain, was something that went extremely well. 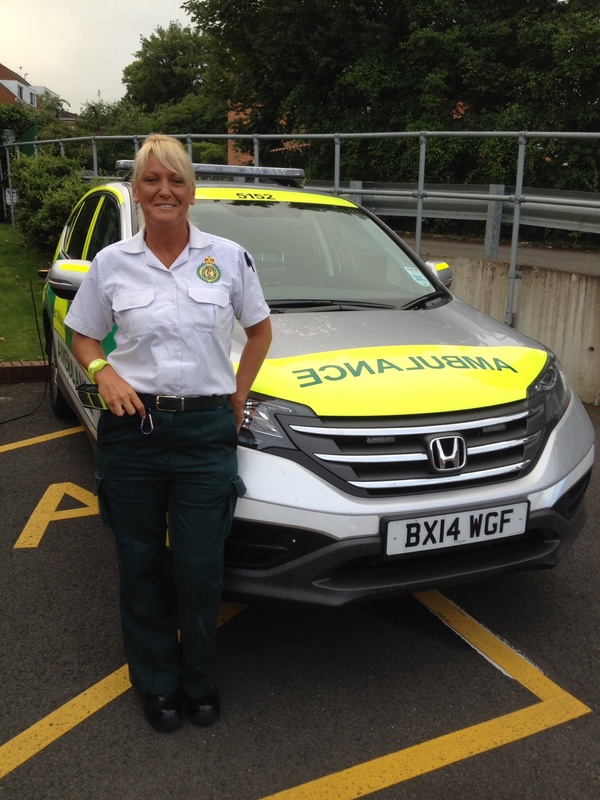 “It was then a natural progression to experience other pride events throughout the West Midlands Ambulance Service area and represent the Trust, with Warwickshire being the first on the agenda. “Members of the team will be taking an ambulance with them and handing out freebies, providing useful advice about using 999 and hopefully encourage people to get more involved with their ambulance service by signing up as official members. “The Trusts very own Tom Barnwell (‘The Voice’ singer) is also performing at the event. For photographs of the parade and to follow the team’s progress at Pride this weekend, follow @wmaslgbt on Twitter or search or #WMASpride. Thursday 26th June 2014 – 8.40am – Chris Kowalik. The driver of a soft-top sports car that ended up on its roof in a ditch, has escaped serious injury. It happened near Swindon Golf Club in south Staffordshire. 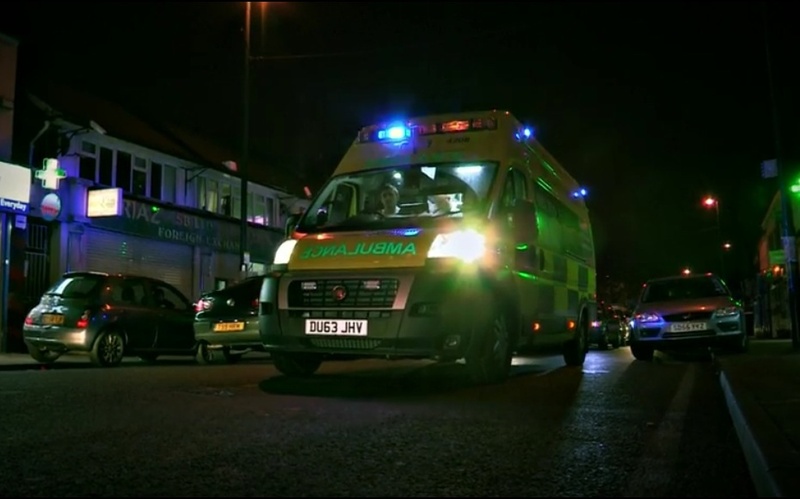 West Midlands Ambulance Service was called shortly after 8.40pm last night (Wednesday). Thursday 26th June 2014 – 8.35am – Chris Kowalik. A motorcyclist has been badly injured in a road traffic collision with a lorry. 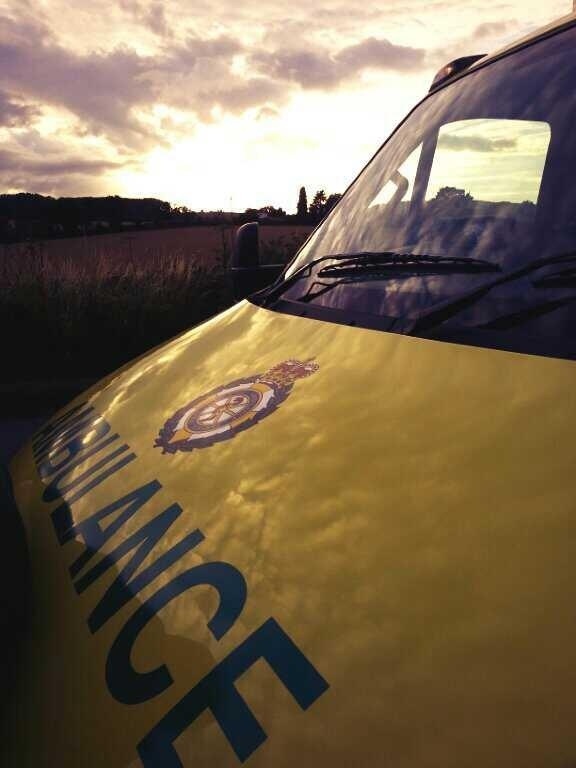 West Midlands Ambulance Service was called to the A454 at Shipley shortly after 8.15pm yesterday (Wednesday). 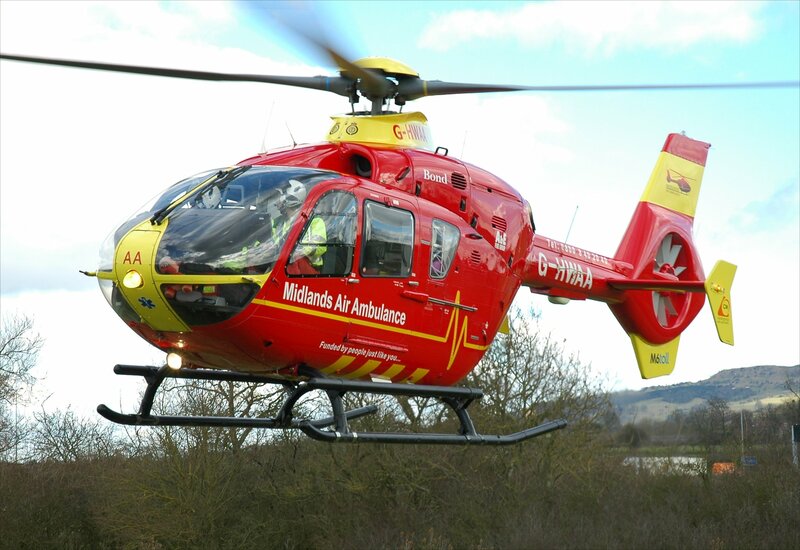 The Midlands Air Ambulance from Staffordshire, the Warwickshire and Northamptonshire Air Ambulance, the MERIT trauma team consisting of a trauma doctor and a critical care practitioner, a paramedic area support officer and two ambulance crews attended. A West Midlands Ambulance Service spokesman said: “The motorcyclist, a man in his fifties, had a broken right arm, a broken leg and a suspected fractured pelvis. 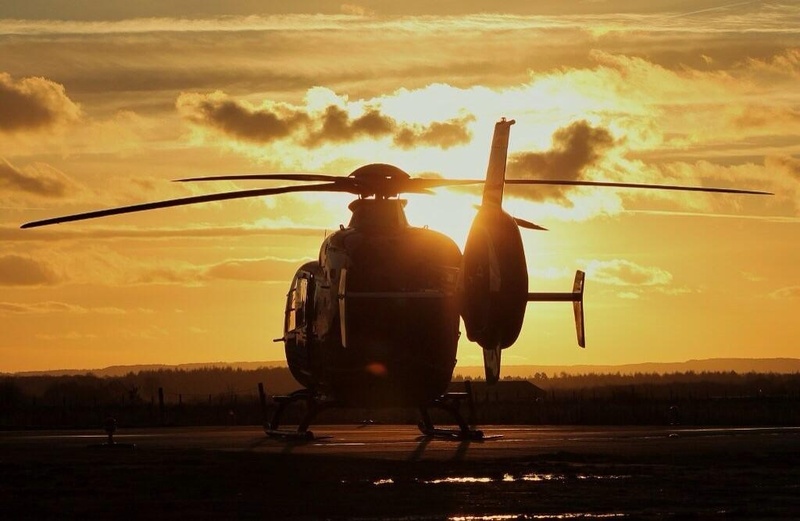 He was fully immobilised, given pain relief and was flown by the Warwickshire and Northamptonshire Air Ambulance to Queen Elizabeth Hospital Birmingham. If you use an adrenaline auro-injector, are you aware of the new guidelines? New guidelines have been issued to patients who suffer from severe effects of anaphylactic shock. The number of cases of anaphylactic reactions is increasing in the UK. Patients who have an anaphylactic reaction have life-threatening airway, breathing or circulation problems. 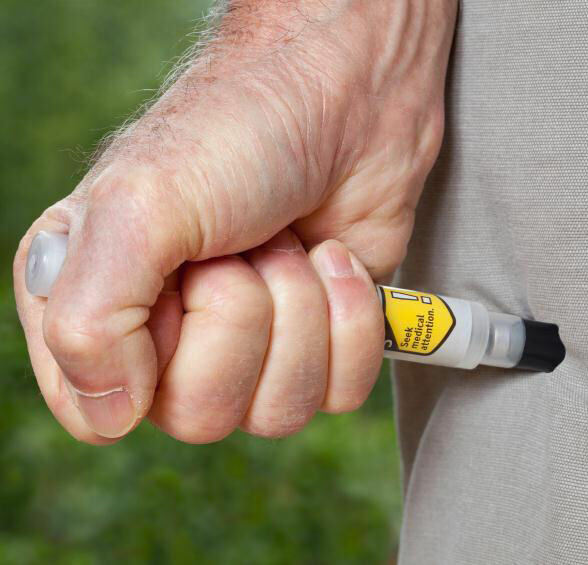 The MHRA (Medicines and Healthcare Products Regulatory Agency) has issued new guidance on the use of adrenaline auto-injectors by patients. If you carry one, please make sure that you have read the new guidance; it suggests you should be carrying two. Wednesday 25th June 2014 – 2.30pm – Jamie Arrowsmith. 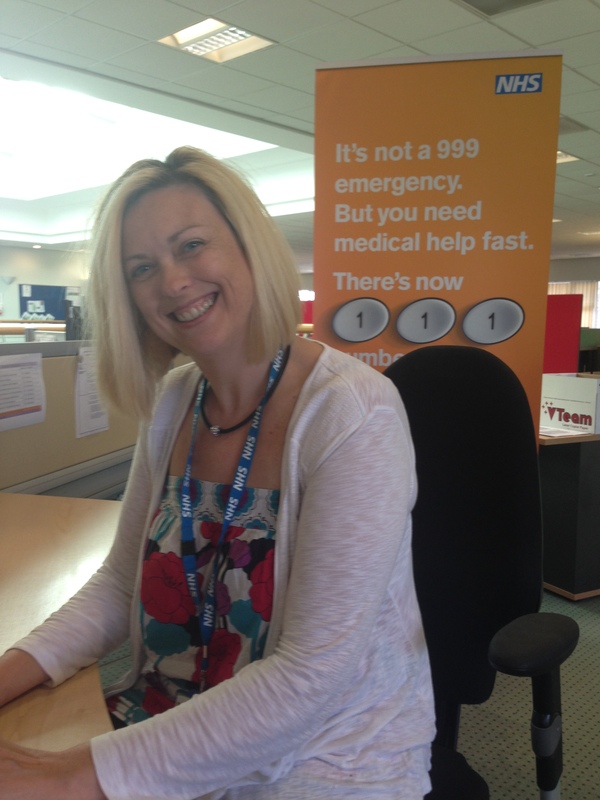 An NHS 111 (West Midlands) call centre worker is preparing to fly high in the name of charity whilst ensuring she has a wedding anniversary to remember. Clinical Quality Improvement Advisor Natalie Neale, from Dudley, is preparing to take part in a daring skydive on Tuesday, July 1, when she will jump with the Red Devils from 10,000ft. Natalie, will have an extra special reason to look forward to landing safely on the ground, as she is jumping on her wedding anniversary. “I’m very excited about it and not nervous at all. The date coincides with my wedding anniversary so I hope the life insurance is paid up to date,” she joked. If you would like to sponsor Natalie ahead of her skydive, visit http://fundraising.midlandsairambulance.com/natalieskydive to find out more details. Picture caption – Daredevil Natalie Neale is looking forward to her skydive which she is doing to raise funds for the Midlands Air Ambulance. 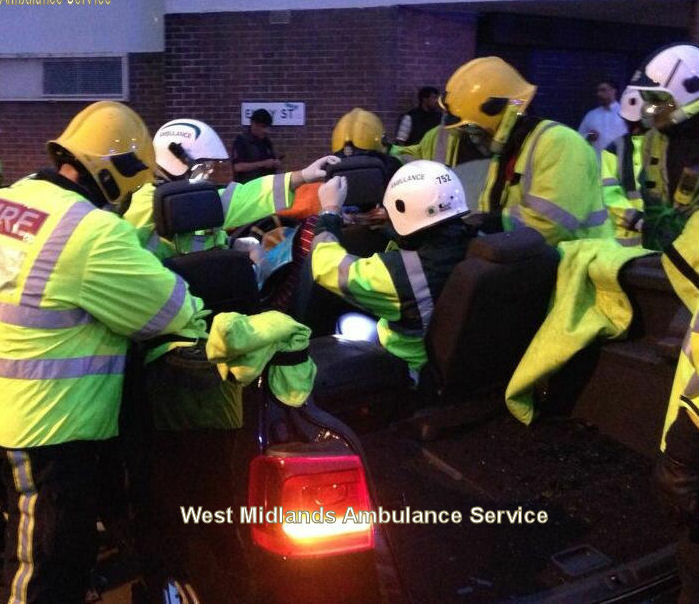 Picture by West Midlands Ambulance Service. Wednesday 24th June 2014 – 9.30am – Chris Kowalik. 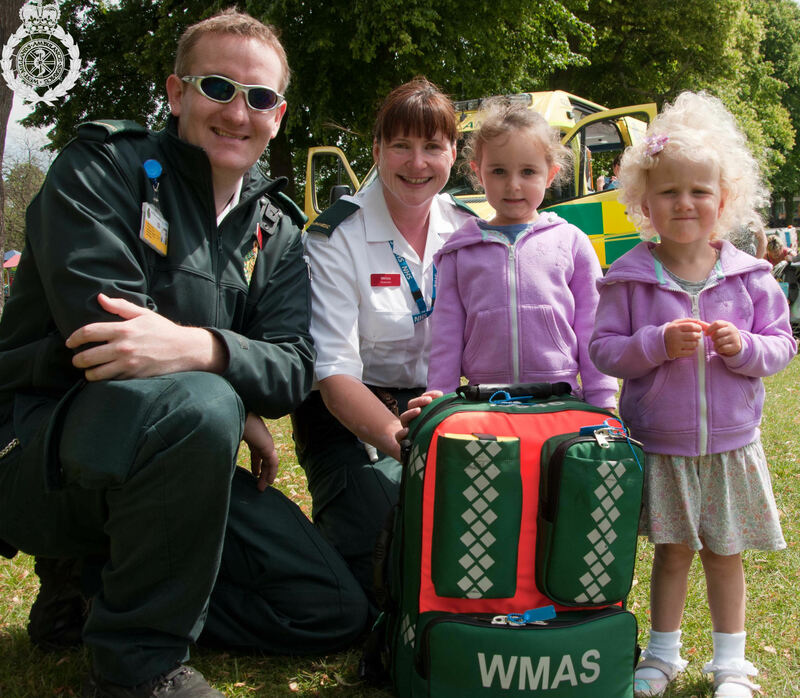 New mums and dads and their young children have been taught about the work of West Midlands Ambulance Service at a safety awareness event in Shropshire. Sure Start Children’s Centres in Shrewsbury held their annual ‘Party in the Park’ at the town’s quarry on Thursday 19th June. It was attended by hundreds of parents and children up to the age of five. Paramedic Edd Davis who has been on an educational tour of primary schools in Shropshire was there along with colleague Mel Jago. They attended in an ambulance which the children were shown around. Wednesday 25th June 2014 – 8.30am – Chris Kowalik. The dangers of playing on the railway have been highlighted by the injuries of a teenager who came into contact with a high voltage cable. It happened at the railway depot in Hunters Lane, Rugby, Warwickshire. West Midlands Ambulance Service was called shortly before 9.55pm last night. Two advanced community paramedics, a paramedic area support officer and a BASICS emergency doctor attended in rapid response vehicles, along with an ambulance crew. A West Midlands Ambulance Service spokesman said: “The teenage boy was reportedly playing with friends when he came into contact with an overhead cable. “He had serious burns to his neck and slighter burns to his shoulders and feet. His burns were treated and dressed at the scene. He was in a stable condition. Tuesday 24th June 2014 – 5pm – Chris Kowalik. The M6 was closed in both directions earlier today after a minibus collided with the central reservation and overturned near Corley Services. It happened on the southbound carriageway. West Midlands Ambulance Service was called shortly before 3.10pm today. A paramedic area support officer in a rapid response vehicle, a senior paramedic officer in a rapid response vehicle and three ambulance crews attended. A West Midlands Ambulance Service spokesman said: “The woman driver and a woman passenger were both immobilised with the use of spinal boards and neck collars as a precaution and were both taken to University Hospital Coventry and Warwickshire. M6 RTC s/b nr Corley Services update. 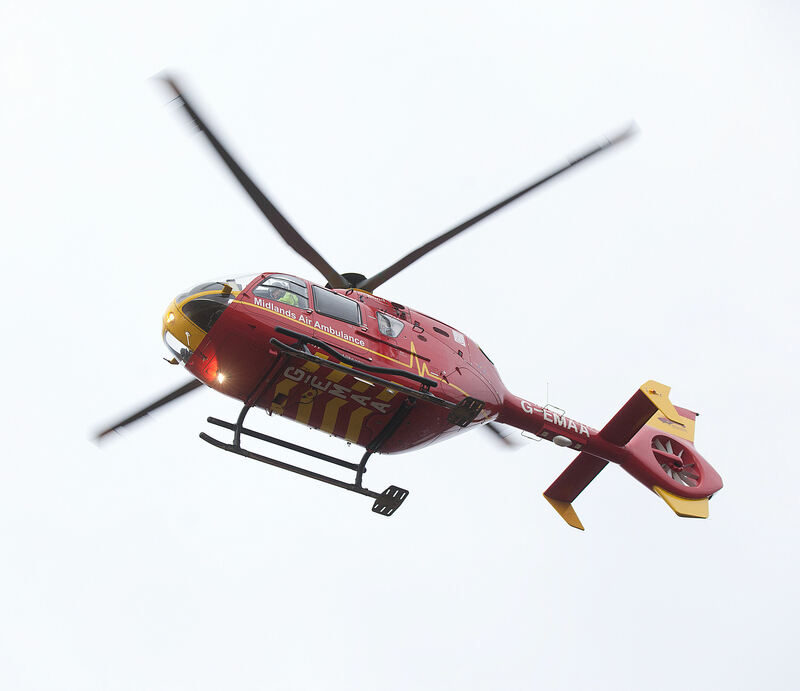 Boy and two women taken to University Hospital Cov & Warks. No serious injuries. Tuesday 24th June 2014 – 4.10pm – Chris Kowalik. 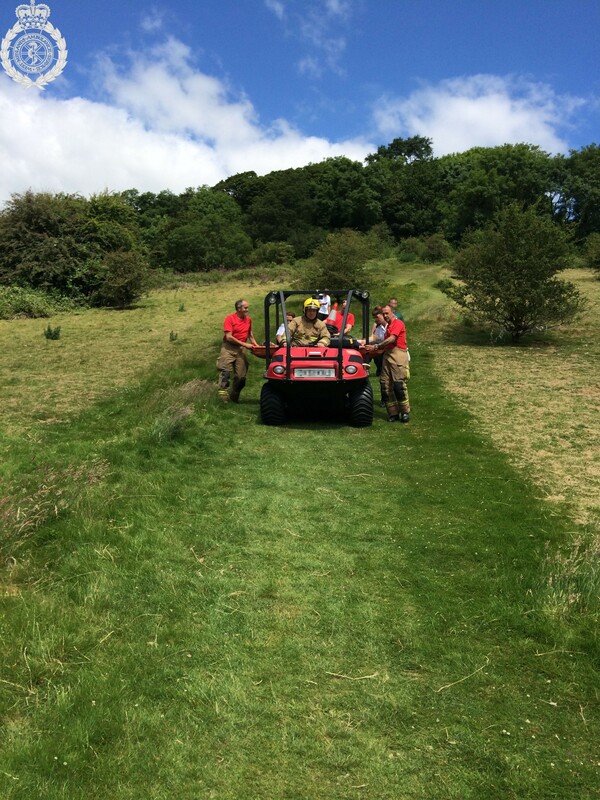 The Ambulance and Fire Services came together this morning to help a woman who fell on a steep hill while out walking her dogs in Herefordshire. West Midlands Ambulance Service was called to the woman in her fifties on Midsummer Hill at Eastnor, shortly before 9.25am today. An advanced community paramedic in a rapid response vehicle and an ambulance crew attended. A West Midlands Ambulance Service spokesman said: “To get to the woman, ambulance staff had to walk across a steep field, through thorns and stinging nettles. “She had broken her ankle and was in a lot of pain. A splint was applied and pain relief was administered. “If getting to her was difficult, getting her out was going to even harder. Hereford & Worcester Fire and Rescue Service was called in to help. Pictured above: ambulance and fire crews working together. Tuesday 24th June 2014 – 1.15pm – Chris Kowalik. 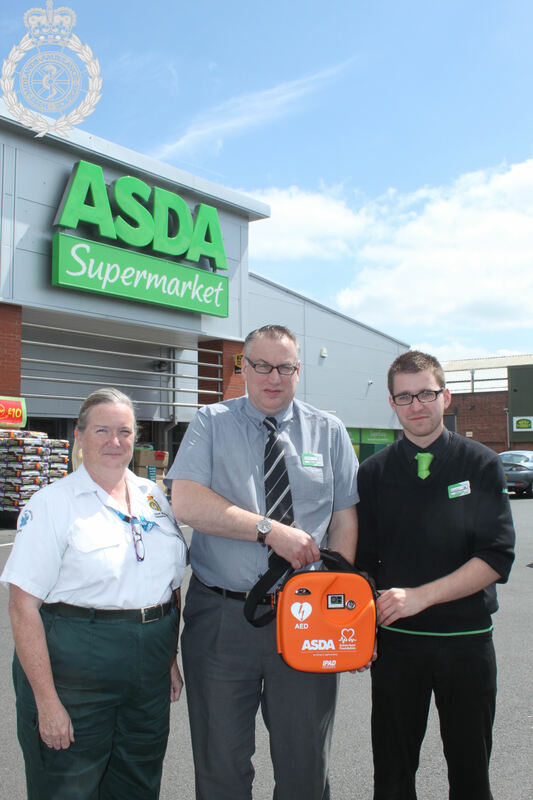 ASDA stores in Herefordshire and Worcestershire have been fitted with lifesaving equipment. 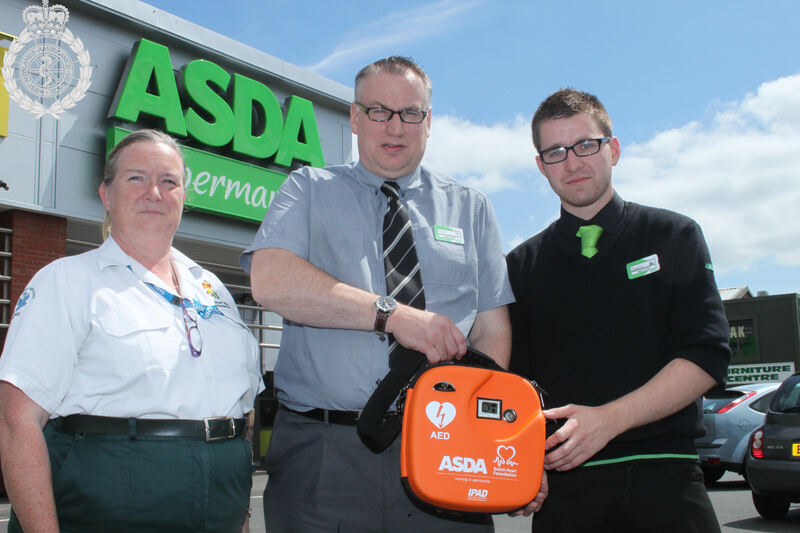 Defibrillators are being installed in all of ASDA’s stores throughout the country in conjunction with the British Heart Foundation. A defibrillator is a device that could restart the heart of someone who suffers a cardiac arrest. Today (Tuesday 24th June) it was the turn of the store in Kidderminster where staff were trained in its use by West Midlands Ambulance Service. Today completes the installations for the two counties’ stores; the others being Hereford, Worcester, Pershore and Bromsgrove. A cardiac arrest is not a “heart attack”. Will it be the busiest weekend ever? Tuesday 24th June 2014 – 1.00pm – Murray MacGregor. Ambulance bosses are bracing themselves for what could be one of the busiest weekends on record. The concerns come after new figures showed that last weekend (Friday 20th – Sunday 22nd June 2014) was the third busiest since the Trust was set up in 2006. The only weekends that have been busier were when the region was blanketed in a thick layer of snow. 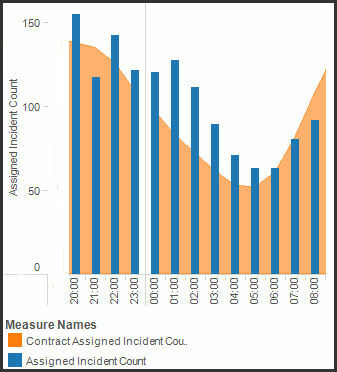 Over the three days, the Trust responded to 8,432 incidents. That is 14.6% more than the previous year which accounted for 7,358. 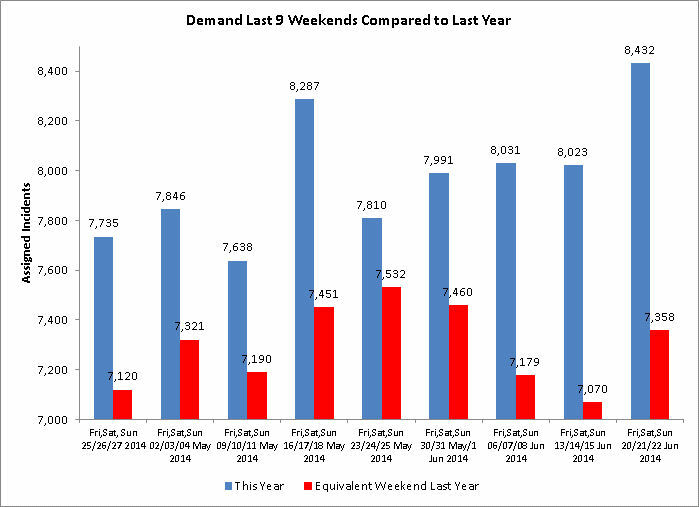 What is causing the ambulance service most concern though, is that demand has been rising rapidly for over two months; at a rate that is far above what would have been expected. Worse, this weekend will see a combination of June’s pay day, potentially good weather and it historically being a very busy weekend combine to create what could be another very tough weekend responding to calls. Acting Emergency Services Director, Nathan Hudson, said: “Our staff are working incredibly hard to respond to calls with many coming in on their days off to provide additional ambulance crews so that we can deal with the demand. “However, we want the public to play their part too. We would urge everyone to ‘Choose Well’ and make sure that they use the most appropriate part of the NHS to access the treatment and advice that they need for their condition. Head of Performance, John Wright, added: “When we look at the types of calls that we have received over the last few weeks, we see lots that are less serious . “Before dialling 999, take a moment to consider whether you actually need an ambulance. Is your condition life threatening such as a stroke, heart attack, serious blood loss, an unconscious patient or choking? Tuesday 24th June 2014 – 11.40am – Steve Parry. A driver has died following a road traffic collision in Shropshire. 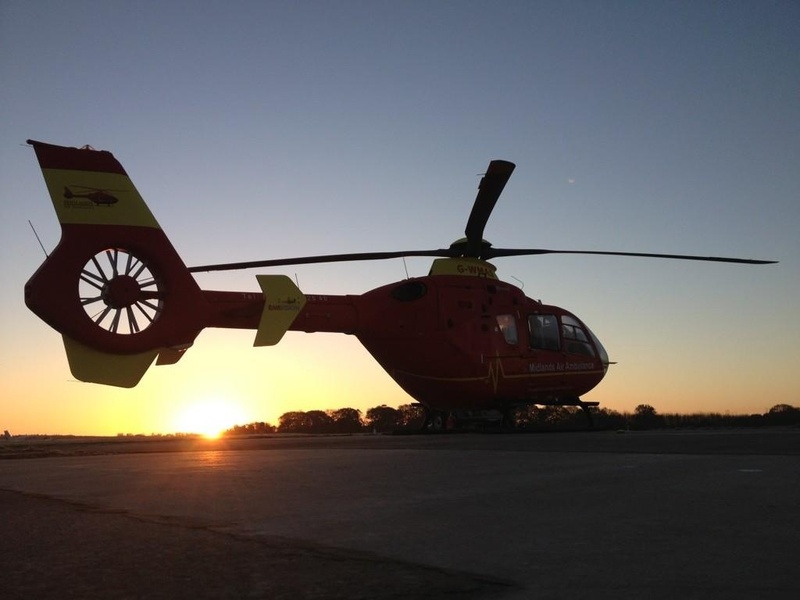 West Midlands Ambulance Service was called to Berwick Road, Crossgreen, north of Shrewsbury at just after 7.45am. A West Midlands Ambulance Service spokesman said: “Crews arrived to find a car had left the road and was among trees. Monday 23rd June 2014 – 6.30pm – Murray MacGregor. The strength of modern cars has ensured that four men have escaped serious injury after a crash in Birmingham. The crash happened at the junction of Cattell Road and Bordesley Green Road at 4.10pm on Monday afternoon. Two ambulances, a rapid response vehicle and a paramedic officer were sent to the scene. A West Midlands Ambulance Service spokesman said: “Thankfully the level of injuries were all relatively minor. “One man in his 30s was cut free from his vehicle by firefighters. He was immobilised using a neck collar and spinal board as a precaution and taken to Heartlands Hospital complaining of right sided pain. Due to the location of the collision, there were considerable traffic delays in the area. Monday 23rd June 2014 – 10.45am – Jamie Arrowsmith. Five members of the same family required treatment from paramedics following a road traffic collision in Birmingham this morning. The crash occurred on Nineveh Road, Handsworth, at 8.20am and West Midlands Ambulance Service sent four ambulances, two paramedic area support officers, two doctors and a rapid response paramedic to the scene. A West Midlands Ambulance Service spokesman said: “Crews arrived to find significant traffic disruption at the scene following a collision between a car and five pedestrians. “Reports at the scene suggested one patient, a seven year old boy, had been dragged underneath the car for approximately 50ft, leading to serious injuries. “Following assessment from crews, he was treated for injuries to his face and a fractured arm. He was given pain relief at the scene before being taken on alert to Birmingham Children’s Hospital. A doctor travelled with the boy to continue administering emergency treatment en-route. “Four other patients also required treatment on scene from medics before being taken to City Hospital, Birmingham. “A woman, the mother of the family, was treated for leg injuries and a dislocated shoulder. Two other boys were injured in the incident, one suffering shoulder and back pain whilst the other had arm injuries. “One further patient, a girl, was treated for leg and hip pain before being taken to hospital. We have no further clarification on ages of any of the other patients. Saturday 21st June 2014 – 8.00pm – John Hawker. A woman has died and a child has been seriously injured following an RTC in Shropshire this morning. The crash occurred on the B5061, Uckington, near to the Horseshoe Inn, Shrewsbury at around 11.30am. Two ambulances, two paramedic officers, two BASICS Doctors and the Midlands Air Ambulance from Cosford attended the scene. A West Midlands Ambulance Service spokesman said: “Crews arrived to find a car that had left the road, been in collision with a tree and had come to rest in a ditch. “Unfortunately, it quickly became apparent that nothing could be done to save the woman driving the car and she was confirmed dead at the scene. “The passenger in the car, a boy believed to be eight years old, suffered multiple serious leg injuries and suspected abdominal injuries and was trapped in the vehicle. The boy received emergency treatment whilst in the car and was then carefully extricated by the emergency services. “The boys condition was stabilised and he was airlifted to Birmingham Children’s Hospital for further emergency treatment. Saturday 21st June 2014 – 7.50pm – John Hawker. 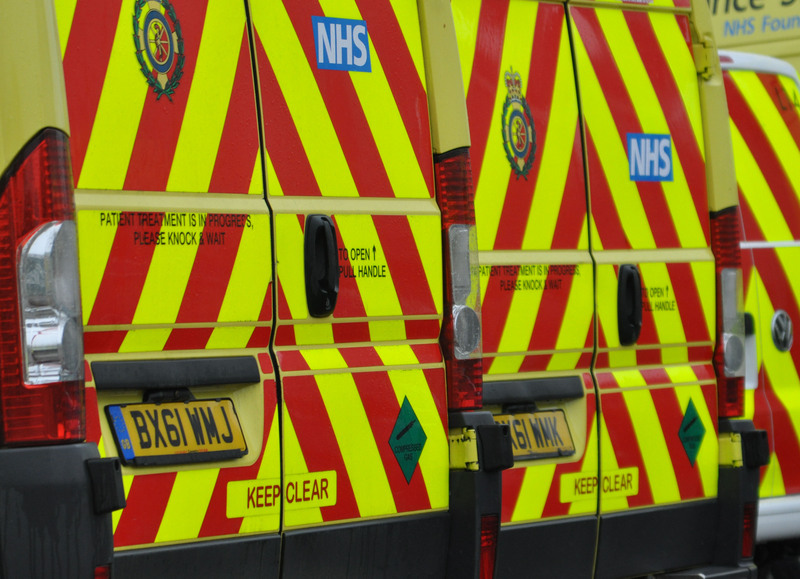 A girl has been seriously injured following an RTC in Cradley Heath today. The crash occurred on Station Road, Old Hill at around 2.40pm. A rapid response vehicle, an ambulance, a paramedic officer and the Midlands Air Ambulance from Cosford attended the scene. A West Midlands Ambulance Service spokesman said: “Crews arrived to find a pedestrian and a car that had been in a serious collision. “The pedestrian, a girl believed to have been 13 years old suffered serious head injuries and had a reduced level of consciousness. 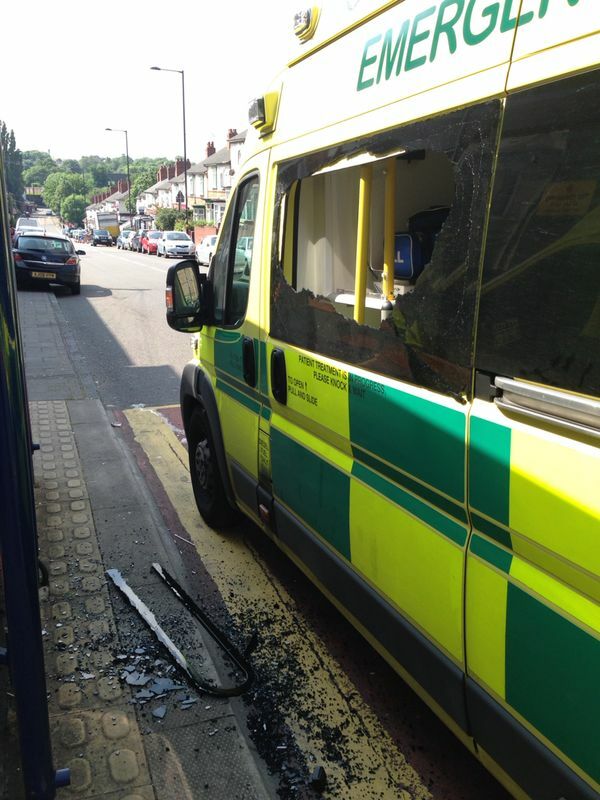 “She received emergency treatment at the scene from medics and her condition was stabilised. “The girl was transferred by land ambulance to Birmingham Childrens Hospital for further emergency treatment. The hospital had medics on standby awaiting her arrival. Saturday 21st June 2014 – 11.30am – John Hawker. A woman has died and three other people have been seriously injured following an RTC just off the M6 this morning. The crash occurred on the exit slip road to Stafford Services, between junctions 15 and 14 southbound at around 5.50am. Four ambulances, a paramedic officer, two BASICS Doctors and the Trusts MERIT Team attended the scene. A West Midlands Ambulance Service spokesman said: “Crews arrived to find a car that had left the road and crashed into a road sign whilst attempting to leave the motorway for Stafford Services. “A woman who was travelling in the car was in traumatic cardiac arrest and CPR was being carried out by Police on scene. Medics took over resuscitation attempts and advanced life support techniques were carried out. “Unfortunately, despite the best efforts of everyone in attendance, nothing could be done to save the woman and she was confirmed dead at the scene. “Three other people that were travelling in the car at the time of the crash all suffered abdominal injuries and received emergency treatment by ambulances staff. “The conditions of the man and two women was stabilised before they were transferred to University Hospital North Staffordshire by ambulance for further emergency treatment. Saturday 21st June 2014 – 7.15am – John Hawker. 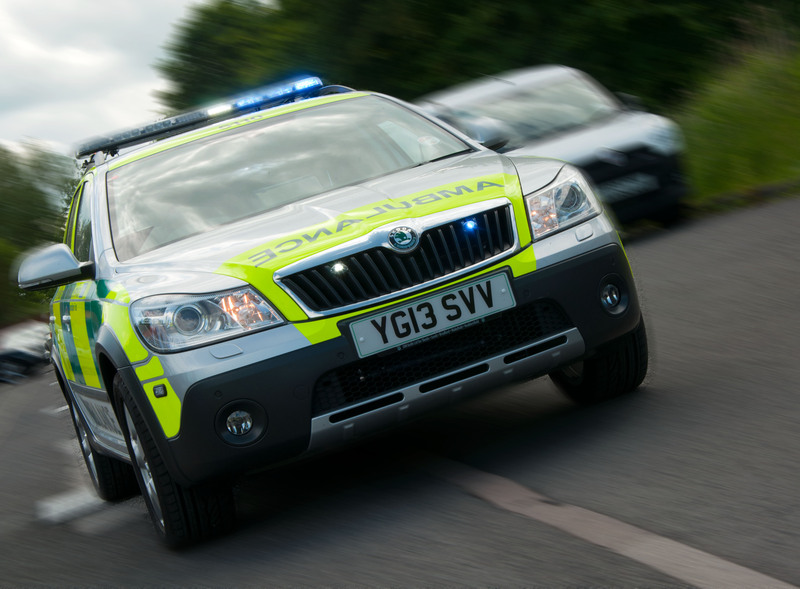 A motorcyclist has suffered severe leg injuries following an RTC in Bromsgrove last night. The crash occurred on Stourbridge Road, Catshill at around midnight. An ambulance, two paramedic officers and the Trusts MERIT team attended the scene. A West Midlands Ambulance Service spokesman said: “Crews arrived to find a motorcyclist that had come off his bike and suffered serious injuries. “The man, believed to be in his early 20’s, received emergency treatment from medics for suspected multiple fractures and lacerations to his legs and also a hand injury. 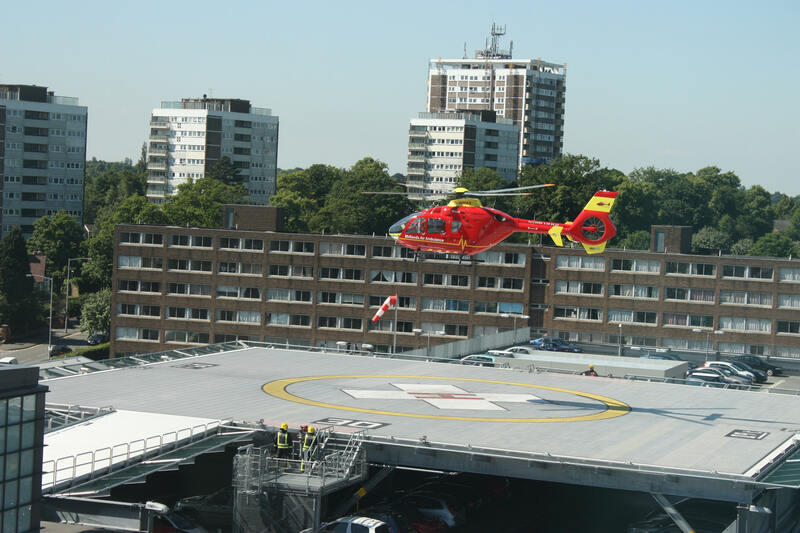 “Once the man’s condition was stabilised he was transferred by ambulance to Queen Elizabeth Hospital Major Trauma Unit for further emergency treatment. Saturday 21st June 2014 – 7.00am – John Hawker. 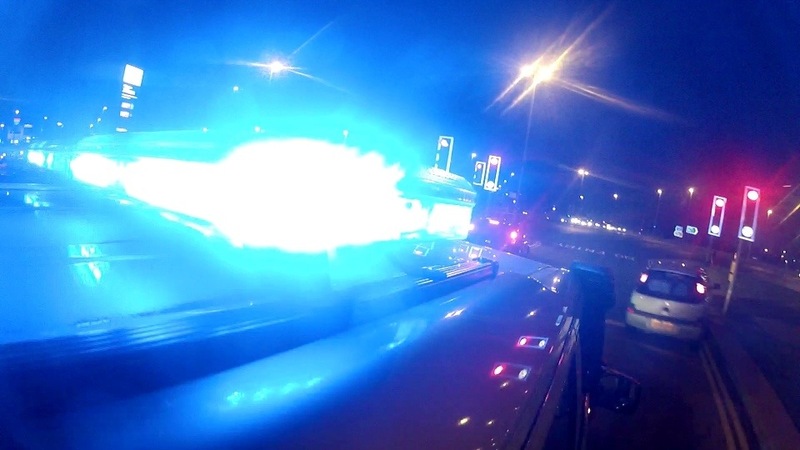 A man has died following an RTC in Coventry in the early hours of this morning. The incident occurred on Fletchamstead Highway, Coventry just after 1.00am. An ambulance, a rapid response vehicle and a paramedic officer attended the scene. A West Midlands Ambulance Service spokesman said: “Crews arrived to find a car and a pedestrian that had been in a collision. “Unfortunately, it quickly became apparent that nothing could be done to save the male pedestrian and he was confirmed dead at the scene. Friday 20th June 2014 – 1.30pm – Claire Brown. A woman involved in a single car crash was thrown from the vehicle and over a 4ft tall hedge before landing in a field near the Shropshire / Welsh border this morning. West Midlands Ambulance Service was called to the A4113 near Knighton shortly after 9.00am today (Friday). A community paramedic, an ambulance and the Midlands Air Ambulance from Cosford with a MERIT trauma doctor on board attended the scene. A responder paramedic from the neighbouring Welsh Ambulance Service was also in attendance due to the close proximity of the incident. A West Midlands Ambulance Service spokeswoman said: “Upon arrival crews found a 25-year-old woman lying in a field, behind a hedge, quite some distance away from a car which had sustained significant damage consistent with it rolling over. “The woman, who was fully conscious and breathing, had sustained a head injury, multiple wounds and suspected fractures to both of her legs. Ambulance staff and the trauma doctor worked as a team to administer treatment. The trauma doctor administered advanced pain relief to help make the woman more comfortable whilst ambulance colleagues carefully immobilised her suspected fractures with splints. A woman tells an ambulance crew she will “rip their faces off” as they try to get to a semi-conscious patient at the Duke of York pub in the Oakengates area of Telford. West Midlands Ambulance Service’s Assistant Area Manager for Shropshire Rob Marsh spoke to BBC Radio Shropshire’s Eric Smith. Friday 20th June 2014 – 8.35am – Chris Kowalik. There are calls for all schools in Worcestershire to be equipped with a potential lifesaving machine. A defibrillator could restart the heart of someone who suffers a cardiac arrest. 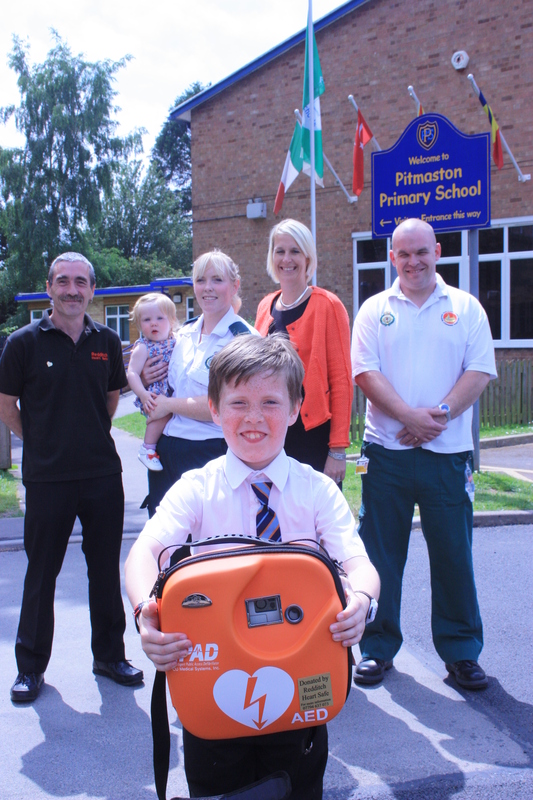 On Wednesday 18th June, Pitmaston Primary School in Worcester took delivery of its defibrillator and twelve staff are to be trained in its use. 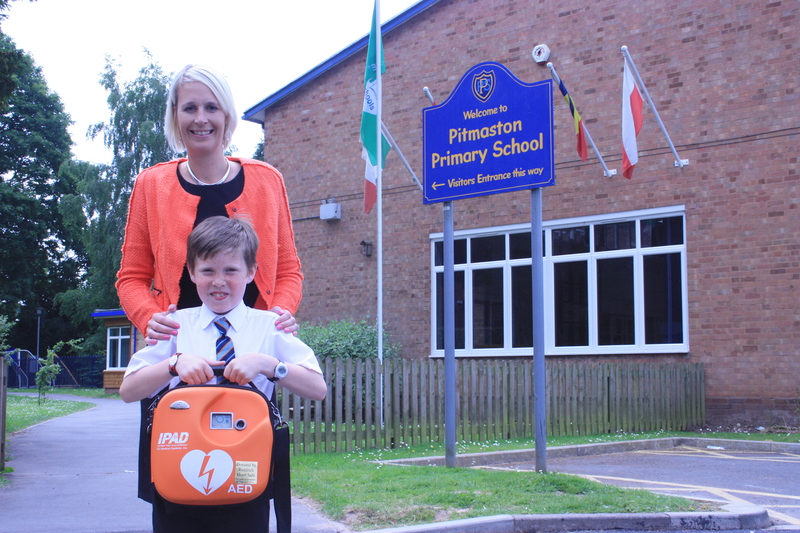 The school agreed to get a defibrillator when it was revealed one its pupils, 9 year old James Vinson, has a heart condition called Hypertrophic Cardiomyopathy. The cost of the machine was covered through fundraising by the school and by James’ mother Alison Vinson, who is also a paramedic with West Midlands Ambulance Service, and with help from ‘Redditch Heart Safe’, a charity founded by a couple following the deaths of two of their children who had suffered cardiac arrests. 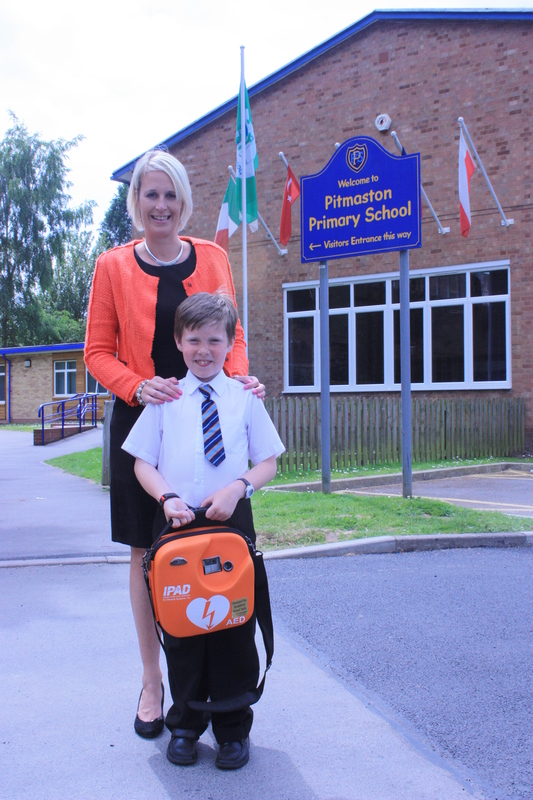 The charity campaigns for defibrillators to be placed in schools and public places. All three would like to see other schools in the county follow Pitmaston Primary School’s example. Alison is also offering to help train the staff of any school that does. (pictured back row left to right: Rob Underwood, Alison Vinson, Kate Wilcock, Dave Harford (Community First Responder). Front: James Vinson. Friday 20th June 2014 – 7.00am – Murray MacGregor. After the massive disappointment in the big game, it will certainly be a night to forget for on ambulance crew in Shropshire and a man who had been watching the match in Birmingham. The Trust was called at 9.30pm to reports of a semi-conscious woman at the Duke of York pub in Market Street in the Oakengates area of Telford. When the crew arrived to treat the woman, who was in her 20s, their way was blocked by another woman who refused to move and threatened to ‘rip their faces off’. The crew pressed their emergency buttons and both police and a paramedic officer were dispatched to the scene. The crew, concerned about the patient, had managed to get to the injured woman and started treating her. Unfortunately, the woman who abused them quickly left the scene and the police were unable to find her. The patient had fallen when the second Uruguay goal went in and after treatment at the scene was taken to Princess Royal Hospital. In a second incident, this time in Birmingham, a man who had been watching the football appears to have had a miraculous escape after falling off a pub car park in Birmingham. The man was at the White Lion in Butlers Lane in the Four Oaks area of Sutton Coldfield at around 10.10pm when he fell around 8 feet. Witnesses said that he landed on his head. An ambulance, a rapid response vehicle and a paramedic officer were sent to the scene. Despite the fall, the man was conscious though rather disorientated. Amazingly he did not appear to be seriously injured and was taken to Good Hope Hospital for further assessment and treatment. Across the West Midlands, there was a notable drop in demand during the game. The number of 999 calls then picked up with it remaining busy but steady through until about 3.00am on Friday morning. Thanks to the planning and additional staffing, the Trust was able to manage the demand and provide a high level of service. Thursday 19th June 2014 – 11.20pm – Murray MacGregor. 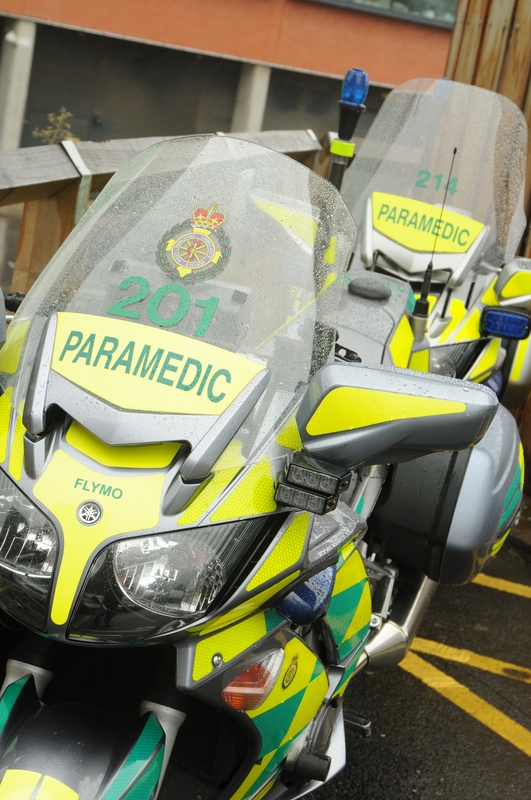 A motorcyclist has been anaesthetised at the roadside by a trauma doctor after suffering multiple injuries following a collision with a car in Birmingham. The crash happened on Eastfield Road in Bordesley Green a little after 9.10pm on Thursday evening. Two ambulances, a rapid response vehicle, a paramedic officer and the MERIT Trauma Doctor were sent to the scene after four 999 calls were received about the incident. A West Midlands Ambulance Service spokesman said: “On arrival, crews found a 21 year old man who was semi-conscious and had suffered multiple injuries. “He had broken both lower legs, had multiple facial fractures and had a possible broken pelvis. “He was anaesthetised at the scene by the doctor before being taken on blue lights to the Major Trauma Centre at the Queen Elizabeth Hospital Birmingham with the doctor travelling on the ambulance. On arrival, he was said to be in a critical condition. Thursday 19th June 2014 – 4.10pm – Chris Kowalik. Two motorcyclists in their seventies who were on a ride-out together have been injured in a collision in Shropshire. It happened at the junction of the A4117 and Common Lane on the outskirts of Cleobury Mortimer. West Midlands Ambulance Service was called shortly after 12.30pm today. An advanced community paramedic in a rapid response vehicle, a paramedic area support officer in a rapid response vehicle, an ambulance crew and the Midlands Air Ambulances from Cosford and Strensham attended. A West Midlands Ambulance Service spokesman said: “One of the riders had a suspected pelvic injury and a deep cut to his left leg. A pelvic binder was applied. His wounded leg was dressed and splinted. He was given pain relief and anti-sickness drugs and was flown to Queen Elizabeth Hospital Birmingham. Thursday 19th June 2014 – 3.35pm – Murray MacGregor. The Trust is once again gearing up for another potentially hectic evening as England play the second of their group stage matches at the 2014 World Cup. Few people can have missed the fact that the match kicks off at 8.00pm against Uruguay and could seal the fate of the team depending on the result. Last Saturday, demand rose very significantly both before, during, but specifically after the match against Italy with the number of incidents our staff attended well above what we would normally have expected to have seen on an average Saturday night. Acting Emergency Services Director, Nathan Hudson, added: “We will once again have additional crews and paramedics in rapid response vehicles in place around the region along with extra staff in the Emergency Operations Centres in Brierley Hill and Stafford. “We all have our fingers crossed for the right result. All we’d ask is that ‘when’ that happens, people enjoy the moment sensibly. After all, there’s at least one more match to play. Thursday 19th June 2014 – 12.45pm – Chris Kowalik. Volunteers are particularly needed in and around Shrewsbury, Wem, Shawbury, Ellesmere, Clun Valley, Ludlow, Clee Hill, Market Drayton, Newport, Shifnal, Albrighton and Cleobury Mortimer. Community Response Manager Cliff Medlicott said: “Volunteers come from all walks of life. When they make themselves available to respond they can continue to go about their daily lives, but if an emergency call is received by the ambulance service within a five or six mile radius, they are sent and always backed-up by an emergency ambulance service vehicle. Applicants will be interviewed in August. Successful interviewees will be invited to attend the next training course (four weekends over eight weeks) beginning in September. Thursday 19th June 2014 – 12pm – Chris Kowalik. Volunteers are particularly needed in and around Malvern, Upton-upon-Severn, Tenbury and Broadway. Did you follow our day out with an advanced paramedic today? We were out with Simone in Stourbridge today. You can follow the range of incidents she attended and see just how few patients ended up going to hospital. Wednesday 18th June 2014 – 2.25pm – Jamie Arrowsmith. One woman has died and another has been injured after the car they were travelling in ended up on its roof in Leamington earlier this morning (Wednesday). West Midlands Ambulance Service received the call to Queensway, near to the junction with Juno Drive, shortly after 11.20am. Two ambulances, a paramedic area support officer and the Warwickshire and Northamptonshire Air Ambulance were dispatched to the scene. The fire service and police were also in attendance. A West Midlands Ambulance Service spokesman said: “Crews arrived to find a car which had come to rest on its roof. “Unfortunately, it quickly became apparent that nothing could be done to save the driver of the car and she was confirmed dead at the scene. 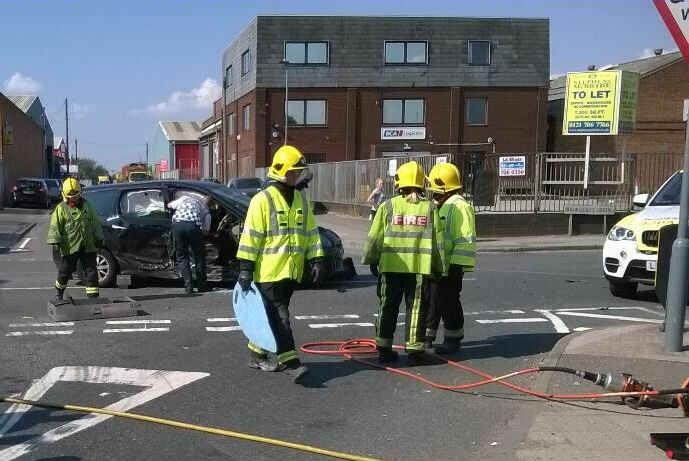 “Working closely with the fire service, crews carefully immobilised the passenger, a woman in her 80s, with the use of a spinal board and neck collar and she was cut free from the car. “She was then taken to Warwick Hospital by land ambulance for further treatment to knee and back injuries. Tuesday 17th June 2014 – 11.30am – Claire Brown. With the weather improving for motorcyclists, the Trust’s ‘Emergency Bikers’ Mark and Steve are appealing to fellow riders to stay safe on the Region’s roads. Motorcycle Paramedics Mark Hayes and Steve Harris will be popping along to Bassetts Pole bike meet this evening (Tuesday) to help educate motorcyclists about the dangers of not wearing appropriate protective clothing. They’ll be bringing along a former colleague to help. John Brown worked for the Trust for 16 years and was a motorcycle paramedic for around six years. 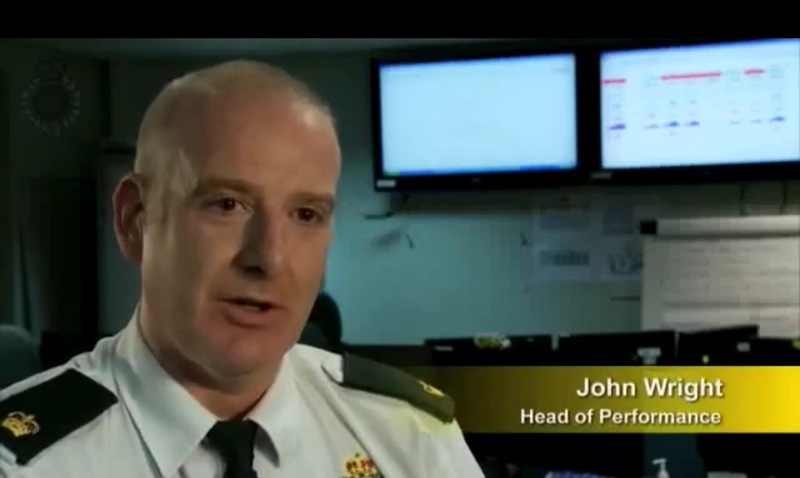 Whilst off duty one morning, John was involved in a horrific motorcycle accident and consequently lost a leg. Mark, who has been riding motorcycles for more than 20 years, said: “I hope that John’s personal experience will help to change the minds and habits of those bikers that throw caution to the wind when they’re on two wheels. I’ve dealt with more accidents involving riders than I care to remember during my career. 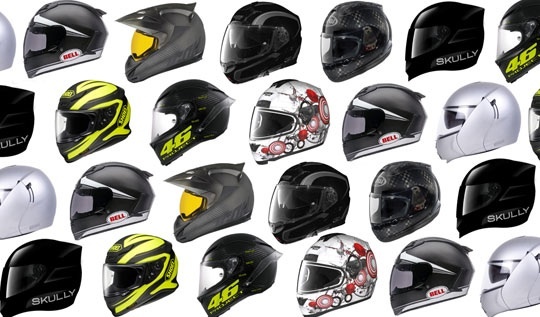 “We hope that by attending the bike meet later on today we’ll be able to encourage motorcyclists to wear the correct protective clothing which will help to reduce the level of injury or ultimately help to save their life if they’re ever involved in a crash. “It’s all too tempting to jump on your bike in jeans or shorts and a t-shirt when it’s warm but, believe me, it’s just not worth the risk. A good set of leathers and a safety helmet go a long way to minimising injury as well as closed-toe footwear, preferably over-the-ankle motorcycle boots and full leather gloves. Mark, Steve and John will be at the bike meet at the Bassetts Pole Inn, London Road, Bassetts Pole, B75 5SA from 7pm tonight. Monday 16th June 2014 – 5.10pm – Suzie Fothergill. A pilot has escaped serious injury after his glider crashed to the ground in Shropshire today. West Midlands Ambulance Service dispatched an ambulance, a paramedic area support officer and the Midlands Air Ambulance from Strensham to the Long Mynd in Church Stretton shortly before 1pm this afternoon. The fire service was also in attendance. A West Midlands Ambulance Service spokeswoman said: “Crews received a 999 call to a glider crash on the Long Mynd this afternoon. It was reported that the glider, which was being towed approximately 100-200 feet in the air, plummeted to the ground before skidding and overturning on to its roof. “Crews worked closely with the fire service and staff from the gliding club to safely extricate the pilot from the aircraft. Fortunately, the pilot, a man in his 50’s, walked away from the incident with a minor abrasion injuries and mild back pain. “The man was immobilised at the scene as a pre-caution and conveyed to Royal Shrewsbury Hospital, via land ambulance, for further assessment and treatment. Monday 16th June 2014 – 3.30pm – Suzie Fothergill. 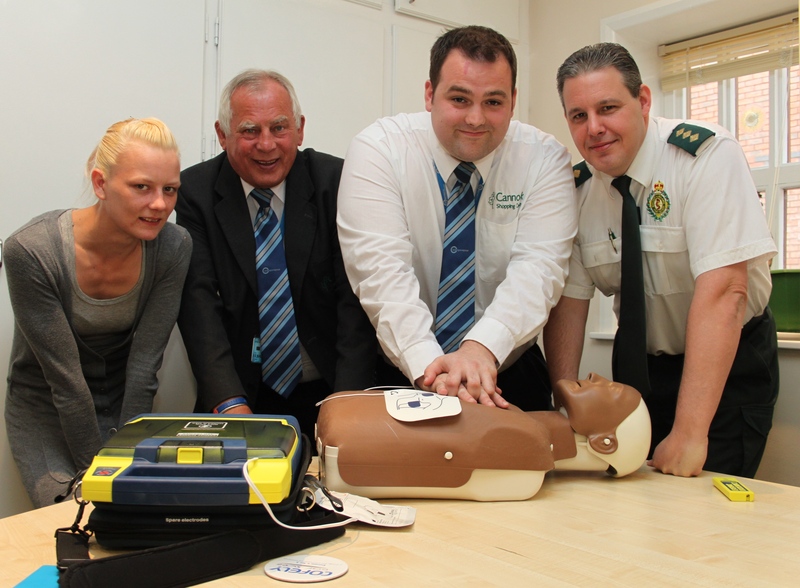 Cannock shoppers could get the shock of their lives should they ever suffer a cardiac arrest whilst at the centre. On Monday 9th June three members of Cannock Shopping Centre staff were trained in the use of defibrillators and first aid to ensure that if any shoppers become seriously ill whilst at the centre, they are given the best possible chance of survival. 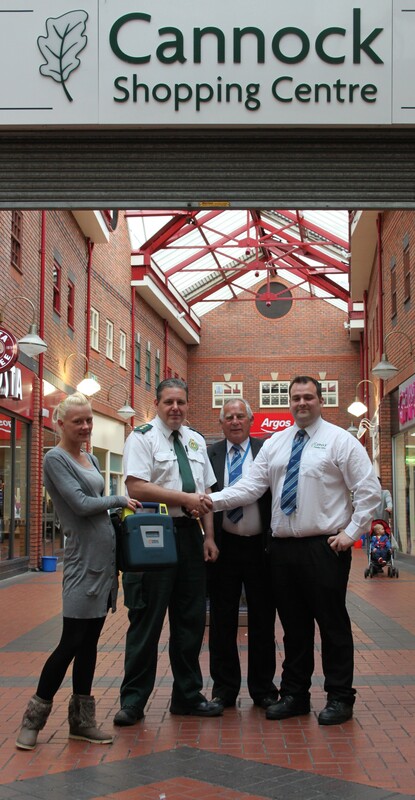 West Midlands Ambulance Service has provided staff with free training and at present has loaned an automated external defibrillator to the shopping centre whilst they work together with the Cannock Rotary Club in applying for a permanent defibrillator. WMAS Community Response Manager, Matt Heward said: “The ambulance service has many community initiatives in place and we strongly believe that by having defibrillators installed in public places, such as shopping centres, schools and business premises, and having people trained in their use and basic first aid techniques, really can help to save lives. 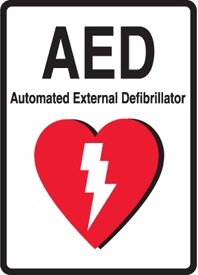 The defibrillator will be located in the Security Control Room within the shopping centre. Cannock also hosts two public access defibrillators at St. Luke’s Church and it is anticipated that a further two defibrillators will be installed within the bus station and ASDA later on in the year. Cannock businesses wishing to enquire about a defibrillator are invited to contact Matt Heward, WMAS Community Response Manager, on 077930 40310. • Picture One: Gemma Gudger, Cannock Shopping Centre Hygiene Operative, Cannock Shopping Centre Security Officer’s Christopher Roy Baker and Daren Jordan, and WMAS Community Response Manager Matt Heward. Picture Two: Gemma, Matt, Christopher and Daren. Monday 16th June 2014 – 11.35am – Murray MacGregor. Bosses at West Midlands Ambulance Service say a decision to help every school in the region get a defibrillator could make the difference between life and death for pupils. The Department for Education has announced plans to allow schools to purchase defibrillators at a reduced cost in time for the start of the autumn term. Head of Community Response, Emma Wilkins, said: “For every parent in the region, there is nothing more important than keeping their children safe at school. “There is no formal data on the number of deaths of pupils under the age of 18 in schools, but the Department of Health estimates around 88 children per year die of sudden cardiac arrest. “Thankfully it doesn’t happen very often, but it can literally happen to anyone whether they have been diagnosed with a cardiac condition or not. “We know from the work that we do every day just how important such machines can be in saving lives. It would be great if every school in the region had a look at the scheme.